Design Team Blog Hop this week. Today is our highlighted day. rest of the G45 design team. their talents and creative bags. As you hop we encourage you to leave comments. and announce them on Friday, September 30th on their blog. to win this grand package of goodies shown below. team members and the chosen day to share. We hope that you take a look and enjoy all the eye candy! We are so happy to share with you all! Here are a few pics of our bag. This is truly a work of art! I love all the detail. Just beautiful! These time difference things are very complicated I've been watching for hours to make sure I'm not on the wrong day! I don't know about trick or treat bag I think I would want to use this all year round! I have been hopping all week. Happy Fall. What pop! What beauty! Love, love, LOVE, the blue gingham background. I love this bag! It's so sweet! That tulle just takes this delightful bag creation over the top. SWEET creativity! Truly a beautiful bag. I am loving the blue gingham and the poppies! Also love that you added what appear to be metal flowers...an unexpected but clever embellishment! Love your project. The details are wonderful! I love the classic look to this bag. Beautiful! Great inspirations...great stash buster also! Always expect the unexpected when seeing what you've created. Love the classicness of your bag with the blue & white gingham & tulle at the top. Amazing original creations - thank you cuz your music always adds to the project. Love that treat bag hopefully u can do a video tutorial on it. Love you bag very sweet. I just love your bag, thank you for sharing it. Love what you have done for your Graphic 45 blog hop. Wonderful! Love the bag, wizard of oz line works so beautfully. Thank you for sharing. The gingham background just pops the front of the bag and the black tulle, oh how I have been waiting to see it on a bag and you delivered! Thank you. wonderful creation ! It seems like characters are bursting out of the bag ! Amazing! Too pretty to use for sure. Love all the fussy cutting gives it such dimension. Beautiful bag- your cut work is amazing! Love your bag, it has so much style with the gingham and its far too nice to give away to little people!! Absolutely gorgeous!!! I'm so inspired, I have to go get me that collection today!!! I just love your site and the detail you used on the bag. I love the metal flower as well. Very Creative Bag. I love the tulle at the top and all the paper piecing. Your bag is just wonderful. I am glad to discover your blog. Fabulous bag! Love how you included all the friends, and the red poppies under Dorothy's feet! This is like stepping back in time!!!! Great job, can't wait to see what else you come up with. What a great bag now I have that song follow the yellow brick road in my head......lol It's gorgeous!! I LOVE LOVE your bag! I want it! But I'm also enjoying your whole site. I'll definitely be back to snoop around! WOW!!! your bag is amazing!!!! Nice job! I luv Graphic 45. This is so clever and cute! The details are wonderful! I like it so much! Love your bag Jack and Cat. Gets the creative juices flowing!! I would love to win this prize pack!! I love Graphic 45 and am glad you two are now designing for Graphic 45! great project.i'd never put anything in it. wouldn't want it to get ripped... love the music. This is stunning! TFS and thanx for the inspiration! Great bag! I Love this paper and your project. I love this bag! All your embellishments and the images of the 4 characters coordinated so perfectly! That is gorgeous!! Love the netting and the colors!! Stunning!!! Stunning work!! Just gorgeous!! Love the netting!! This hop is so much fun. Love the bag. Oooh, how pretty!! I love the tulle-perfect touch! WOW! Love you blog! The bag is darling but have to admit...I'm in love with the little G45 Halloween album that you made even more! So many ideas packed into that little album. My hats off to you on both projects! OM Goodness yet another awesome project from you - you guys blow my mind with your creativity! The black tule, metal embellies & plaid paper are awesome touches! Your bag is just adorable! Love the blue gingham and the Oz gang. The black tulle is the perfect topper! Awesome job on the treat bag. I absolutely love it! This is such a pretty bag! I really love all of the details! Nice job, Alice's treats are her new found friends. Very cute! Lot's of fussy cutting, makes it really detailed! Gorgeous bag! Love the colors and all of the details! Love the "Kitchy" Look to the bag. I am a new scrapper to your site and thanks to the hop I will be an avid fan of yours! Love the background, the gingham really looks like Dorothy's dress! Thanks for the great inspiration. Wow, this is awesome! The tulle is perfect! I wish I could make a bag like this, I know mine would not be anywhere as nice as this, beautiful job! Such a cool and creative treat bag!! Wish I could have had one of these for my goodies when I was a little girl!! I love the big bow on the handle. Your bag is awsome!!!! Love the details of this creation. The background print so much reminds me of Dorothy's dress. The Poppies. Great work. Love it! What an awesome bag!! Love that Dorothy is walking on the poppies! I think this is my favorite treat bag so far in the hop. Love the metal flowers. Mariasgrandma: How cute! Thanks for sharing. Your trick or treat bag makes me smile... truly a 'memory' of watching the movie, over and over again! You are never too old to watch the Wizard of Oz!!!! Definitely a keepsake bag!!! 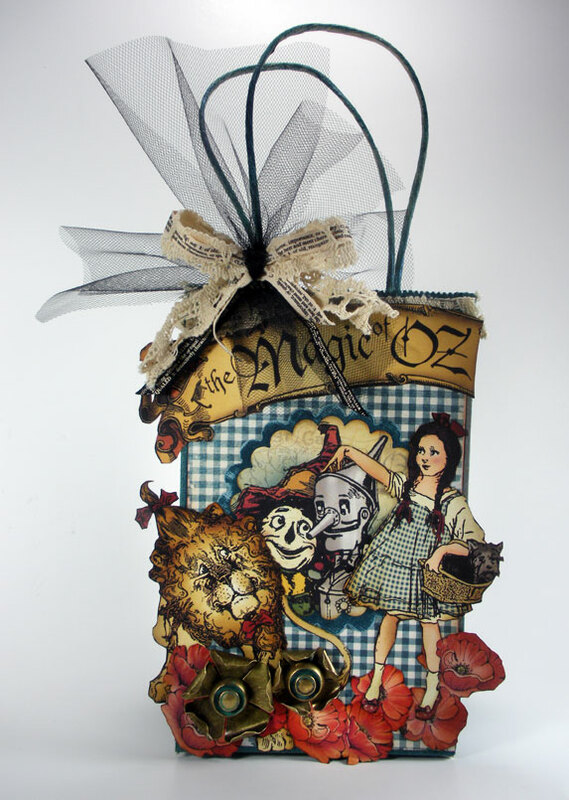 It's amazing how creative and innovative you can be with this totally fun Magic of OZ line!!!! What a beautiful, happy bag! Love how you used the bigger images! Love your trick or treat bag! Wonderful! This is so clever and cute. The details are wonderful! I'm blown away by your beautiful piece! That gingham is so perfect a backdrop for the amazing artwork! Love it! I just love this paper. You did a great job! WOW... THIS BAG IS OZ... I love your design... Thanks for a super hop!!! Graphic 45 has the most awesome things and you guys do amazing magic with it! Love this bag. Your bag is awesome. Love all the detail and design. Great job. This is an AWESOME bag! My fav so far this week I must say!! Love the bag and admire all your work. So much fun to see. I agree with everyone else-a true work of art. It needs to be in an acrylic case to be preserved and enjoyed for years to come.Thank you so much for sharing your astounding creations with us. I love the cute country charm of this, VERY nice!! These creations are just mind boggling!!! this hop and generous prize. I love how you put all the happy characters together on the bag. It gives me such a warm heart. I would probably display this never to be taken down! thanks for the inspiration! love your bag, how long did it take to make? I love your bag. What fabulous paper for this hop! This week is such a treat. This looks so cool and creative. I love it! This is my Flavor'ite treat bag :). !!!!!!! Wonderful bag! Love the use of the tulle! Fabulous goodies and a wonderful project! Love the Wizard of Oz so much!! Thanks for the chance! This bag is perfect. My daughter and family are all going to be the Oz chacters for Halloween and the bags would be such a hit. Perfect bag. 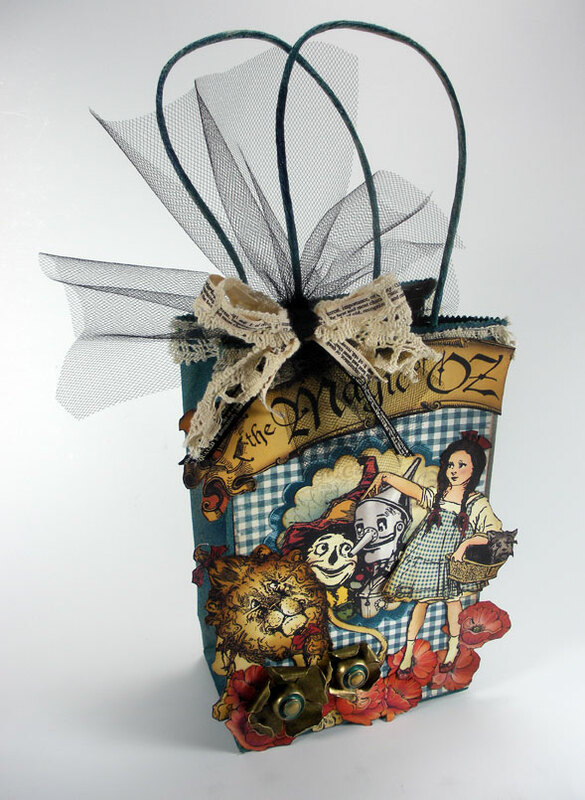 My daughter and family are going to be the Oz characters for Halloween and the bag would be perfect. I love, love your bag. Beautiful! I'm new to your blog thru the hop and your work is fabulous! Great work!! I'd want to display this bag! So beautiful and dimensional. Love how the characters are floating over the poppys. Love the gingham background. So perfect. Wonderful bag. I love the lace and ribbon touches. This is my first time seeing your work - beautiful! I love the blog hop, always discover new artists and products! I had the opportunity to see G45 up and personal at the CHA Chicago this past summer. This bag is Phenomenal! TFS and a chance to win! the tulle is a nice addition! amazing! you are allll soooo talented! I wish I could steal some of your talent! I wish such real friends for your wayas on your bag! This bag is great - I love that you used the blue gingham background - I agree with some of the others that this bag is "classic." Looks like eye candy to me, luv it !!!!! Love your giant bow! Great job! This is a gorgeous bag. I love the metal flowers! Wow wat een prachtige tas!!! Awesome bag! Love the metal! So so pretty. Thank you for sharing. LUV the ribbon and tulle...mt kinda bag! This is my favorite treat bag that I have found yet! Your embellishment bow embellish's the bag over the top of fresh chic design...... you truly have an artistic eye for design. Love the bag. So cute and inventive as usual. Thank you for sharing! Have a great day! So cute. You always do such creative art pieces. Thank you for sharing! Just simply amazing! 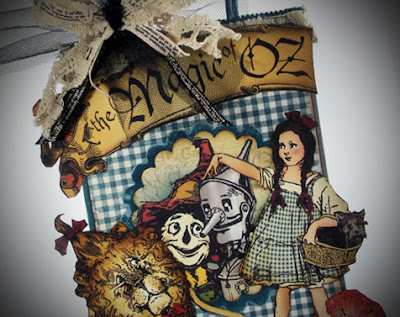 I love the blue gingham background to match Dorothy's dress and all the images you have layered. The trims tied into bows around the handle are such a great touch. What a fun bag...love the whimsy look you created. Love the netting bow. Beautiful bag! Fun, fun design. This would be wonderful on my desk for halloween...... filled with treats!!!! Love your bag it's super cute tfs! Beautiful! Love how u curled the metal flowers. I love your bag with all the main Oz characters. Absolutely love the metal flowers with curled edges...very creative and adds dimension. Very clean and beautiful bag! I like the black "ribbon" it makes it very festive. Oh my WOZ! I love, love, love the Wizard of OZ. I working on a book now. Wish I could have attended your class.